Waltz was popularized all over the world with the music of Johann Strauss in the 20th century. It comes from the German word "waltzen," which means "to turn." The turn is the essence of the waltz step along with rise and fall and sway. This styling makes the Waltz beautiful and elegant. Rudolph Valentino forever immortalized the passionate Tango on film in Hollywood. Years later Al Pacino and then Arnold Schwarzenegger would continue the legacy. 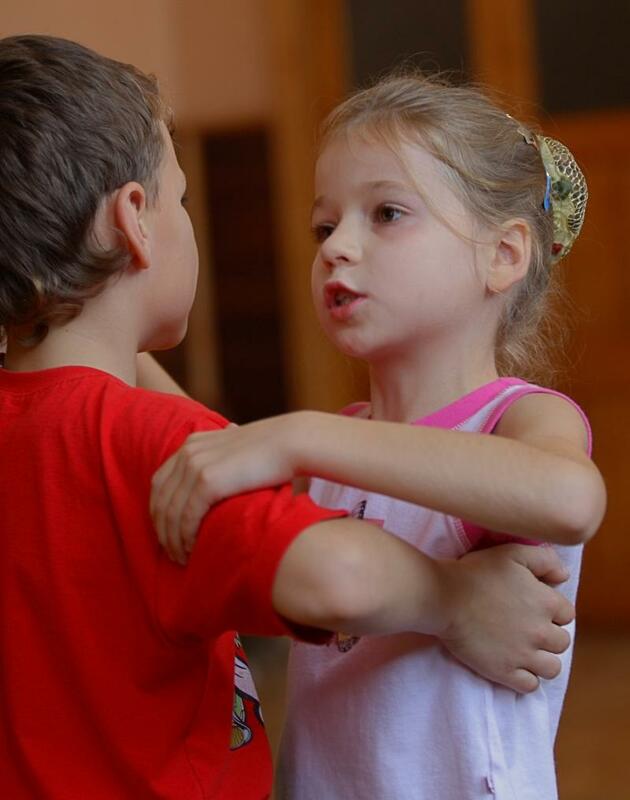 This series makes Tango fun for children and will teach the necessary skills to navigate the dance floor and impress! The Foxtrot was originally danced to ragtime. Today, we still glide around the floor to Frank Sinatra, Michael Buble', Harry Connick, Jr. and many more. Foxtrot is timeless fun and a social essential. Cha-Cha, originally from Cuba, is lively and energetic and danced to Rock, Pop, or authentic Latin music. It has a syncopation on the 4th beat. Rumba derives its movements and music from the Cuban Bolero-son. Steps are kept compact, involve a hip-sway over the standing leg, and is danced with the use of free arms in various figures. East Coast Swing is a standardized form of dance based in six-count patterns that are simplified forms of Lindy Hop. East Coast Swing is upbeat and danced socially to popular American music. Dancing is a highly physical activity. Regular dance practice can increase your child's flexibility, range of motion, physical strength and stamina. The repetitive movements involved in dance can improve muscle tone, correct poor posture, increase balance and coordination and improve overall cardiovascular health. Dancing is an aerobic form of exercise. For children who are overweight, it can potentially help them to lose weight and improve their eating habits. Dance lessons can help children improve their social and communication skills, learn how to work as part of a team, develop a greater sense of trust and cooperation and make new friends. If your child is shy, enrolling her in dance can encourage her to reach out to other children her age and help to reduce her anxiety about new people or places. Dance can also help to alleviate fears related to performing in front of an audience. Becoming a skilled dancer requires practice, discipline and focus, skills that can be useful in other areas of your child's life. Dance lessons can help to spark creativity in young children and help them to develop an appreciation for the arts. Students who regularly participate in dance lessons typically tend to perform better academically than their nonparticipating peers. "FamilyTalk Magazine" estimates that students who have a background in dance tend to achieve significantly higher SAT scores and do better in math and science competitions.